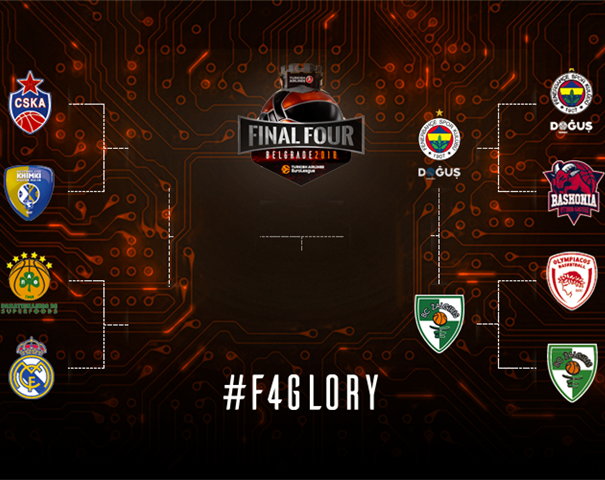 The first semi-final pair at the @EuroLeague Final Four 2018 will be Fenerbahçe Istanbul – Žalgiris Kaunas. The Lithuanian team won in the fourth game of the @EuroLeague Playoffs 2018 against Olympiacos with a score of 101 – 91, while the Turkish team was better than Baskonia with a final result of 83 – 92. 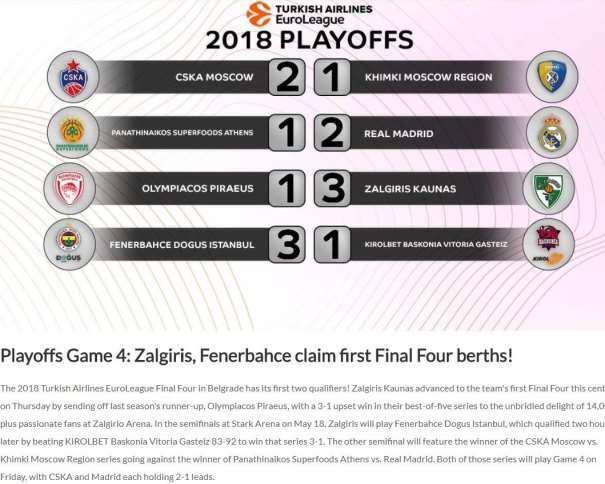 Both semi-finalists won against their opponents 3 and lost only 1 game in the @EuroLeague Playoffs 2018 and booked their tickets to Serbia. Basketball fans are used to see Željko Obradović’s Fener at the @EuroLeague Final Four tournaments, but this was an historical moment for Žalgiris and its coach, Sarunas Jasikevicius. And in the semifinal, the coach (Željko) will face his ex-player from the times in the Greek club Panathinaikos (Jasikevicius). In Kaunas, the sports hall “Žalgirio” was totally green, the fans were supporting their favourite team and celebrated with them such as important club success. During the whole game, the home team was leading and whenever Olympiacos tried to get close, Žalgiris managed to defend their court. Especially in the last quarter, because they were familiar with the magical fourth quarters of this Greek club. And this time, the team from Athens also had a chance to get back in the last minutes but the Lithuanina team was well prepared and, at the end, celebrated on home court. Kevin Pangos led the winners with 21 points, Edgaras Ulanovas posted 20 points and 9 rebounds and Axel Toupane added 11 points. The Serbian guard Vasilije Micić finished the match with 9 points. 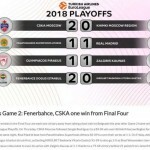 Olympiacos played without injured star Georgios Printezis, but, again, the captain of the team, Vassilis Spanoulis, was the best on the court. He paced Greek team with 19 points and 6 assists; Janis Strelnieks scored 17; Kostas Papanikolaou, 15; Kyle Wiltjer, 12; and Brian Roberts, 10. In Vitoria, Fener was better than Baskonia, but fighting till the end. The first half belonged to the guests and the second one, to the home team, but the diference in the first half was bigger (19 – 25, 13 – 23, 30 – 24, 21 – 20). Both teams had 27 rebounds, but the team from Istanbul had more offensive (12) rebounds than Baskonia (6), and used its second chances to put the ball into the basket. Also, Fenerbahçe had 11 steals over home team 5. An interesting fact was that the home team had a better shooting percentage than the guests. 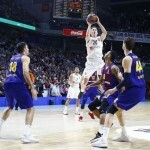 Baskonia made 19 of 31 for 2 and 7 of 16 for 3 points, while the Turkish team had 19 of 34 for 2 and 10 of 28 for 3. The Serbian guard Marko Gudurić and the Italian inside player Nicolo Melli were the players of the match. The first one scored 22 points with 3 assists for 26 index rating, while Melli finished the game with one point less, 3 assists and 3 rebounds. He also had 26 index rating. Nikola Kalinić added 13 points, while the Greek guard Kostas Sloukas had 5 points and 8 assists. Vincent Poirier was the best scorer in Baskonia with 14 points. Rodrigue Beaubois added 13, Johannes Voigtmann scored 12, Marcelinho Huertas and Toko Shengelia each had 11 and Jayson Granger, 10.